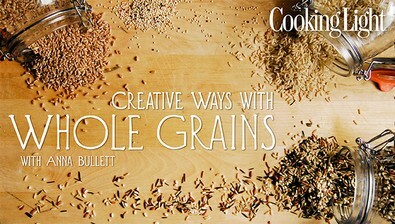 This FREE mini-class is guided by _Cooking Light_ executive chef Anna Bullett, and is packed with delicious recipes and innovative techniques to incorporate whole grains into any meal! Learn the essential methods and correct ratios for perfectly cooked grain, from brown rice to farro and more. Discover the secrets to whole-grain risotto that's loaded with nutrients and always creamy. You'll even learn timesaving techniques for using a slow cooker and tips for storing your grains, for healthy meals any night of the week. Then, put your new skills to use as you make a wheatberry salad packed with golden raisins and goat cheese, a wild rice stuffing full of dried cherries and pecans and more. Plus, find 14 full recipes included in your course materials, for healthy meals even your pickiest eater will devour!